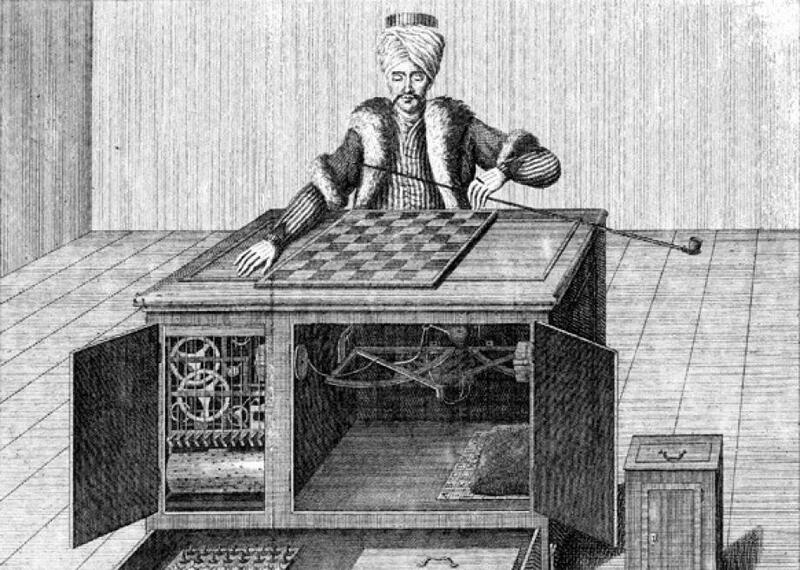 The Turk, a chess-playing robot, was a hoax that started an early conversation about AI. A reconstruction of the Turk. Warnings over the perils of artificial intelligence arms races have made headlines of late, but debates over the possibilities of AI have been raging since the ‘70s. At the dawn of that decade, an inventor by the name of Wolfgang von Kempelen debuted his latest creation in Vienna: A chess-playingautomaton made for Habsburg Archduchess Maria Theresa. 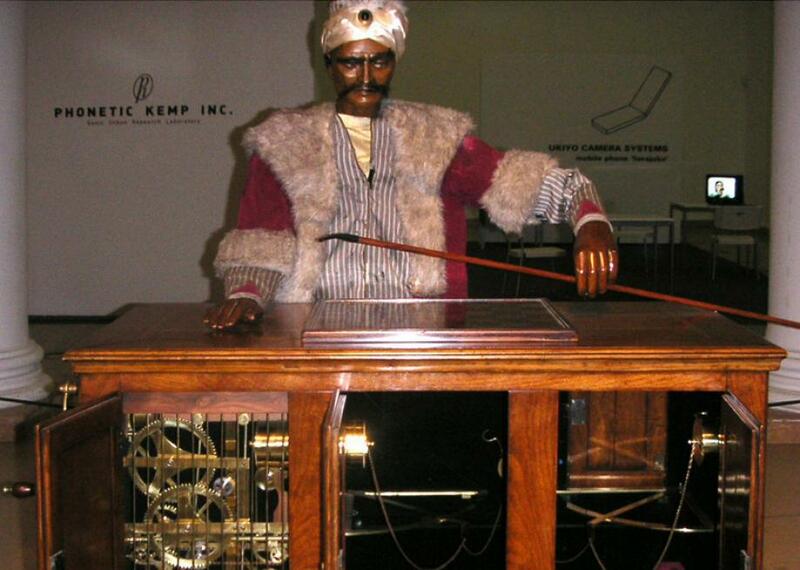 Known initially as the Automaton Chess Player and later as the Mechanical Turk—or just the Turk—the machine consisted of a mechanical man dressed in robes and a turban who sat at a wooden cabinet that was overlaid with a chessboard. 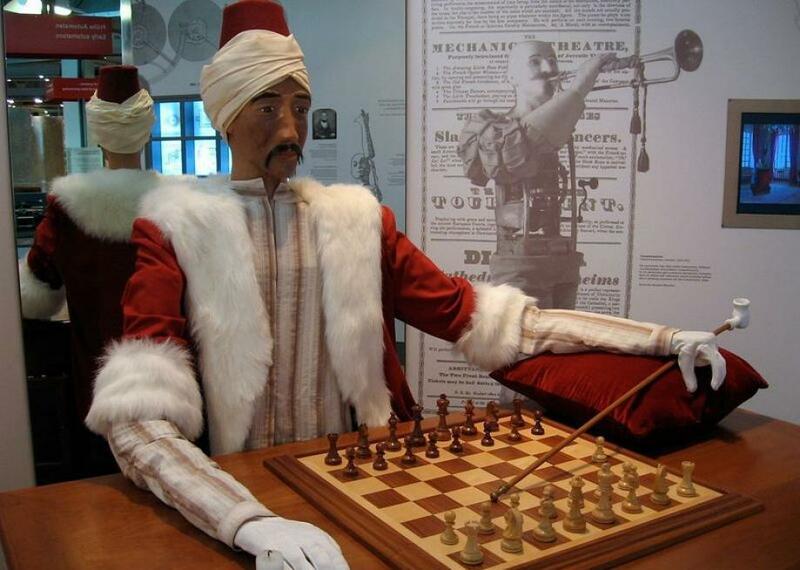 The Turk was designed to play chess against any opponent game enough to challenge him. 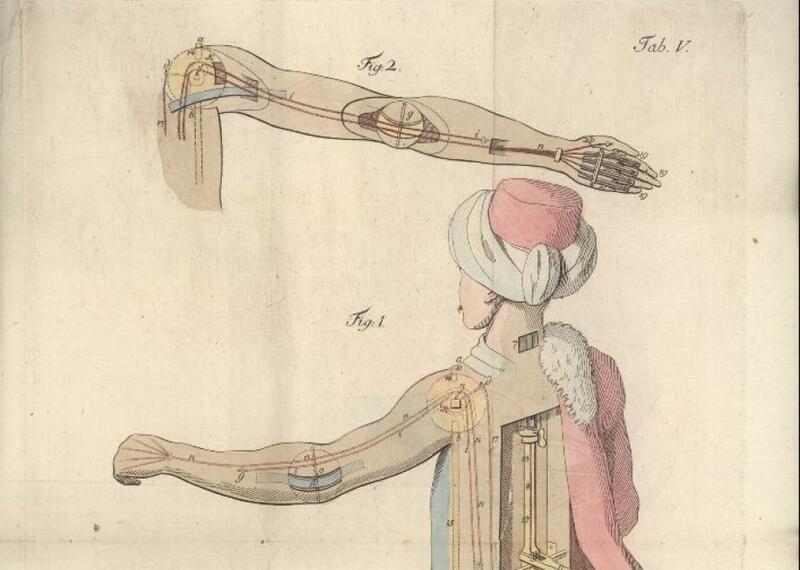 The inner workings of the Turk’s arm, as envisioned by Joseph Racknitz. The Turk serving up some side-eye to those who doubt his intelligence. An exhibition ad from 1818. Thicknesse did not believe, as others did, that von Kempelen was directing the Turk’s gameplay from several feet away using strong magnets, stealthy strings, or remote control. His opinion took the Occam’s Razor approach, with a child-labor twist: He wrote in his pamphlet that the cabinet must be concealing “a child of ten, twelve, or fourteen years of age”—presumably one whose chess talents were prodigious. The notion that someone was hiding in the cabinet was espousedfrequently over the decades, with variations on the size of the hypothetical person as well as their positioning. The cabinet measured four feet long, two-and-a-half feet deep, and three feet high—dimensions that encouraged people to speculate that short-statured people and children were the most likely candidates for the role of hidden Turk operator. Some believed that the concealed person stayed in the cabinet the whole time, using strings, pulleys, and magnets to execute the chess moves, while others thought the operator crawled up into the body of the Turk in order to control him. Could there be a tiny man inside? Racknitz thought so. The most outlandish tale of a hidden operator comes from Jean Eugène Robert-Houdin, a French magician who encountered the Turk in 1844—long after its heyday. In his 1859 memoirs, Robert-Houdin passed on the Turk’s origin story—a clearly apocryphal tale that he nonethelessdescribed in great detail. According to Robert-Houdin, von Kempelen was in Russia during the 1790s when he met a doctor named Osloff. The doctor was sheltering a fugitive Polish soldier, Worousky, whose legs had been blasted away by a cannonball. This soldier happened to be a gifted chess player. 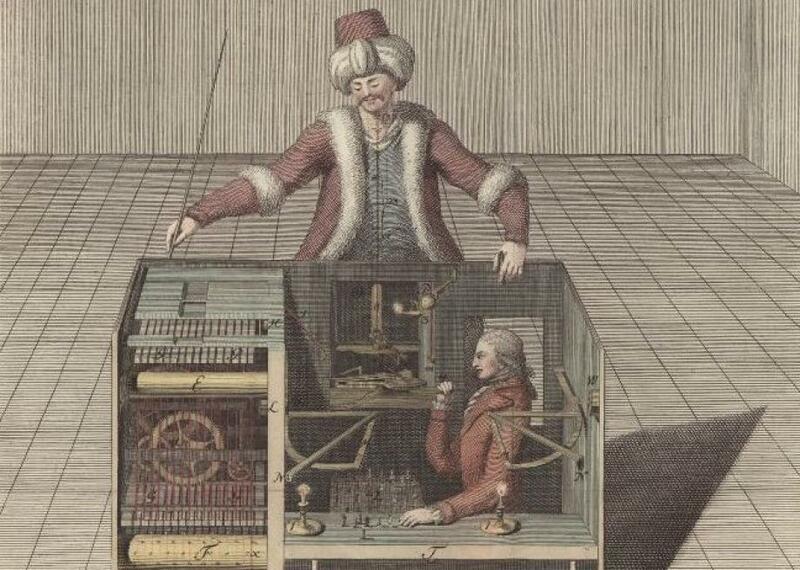 So von Kempelen did what anyone would do in the situation: spent three months building a fradulent humanoid automaton chess player machine equipped with a cabinet large enough to house Worousky, thereby smuggling him out of Russia to safety by touring the automaton through major cities. A foolproof plan if ever there was one. Cabinet doors open, nothing here but clockwork. In the 1820s and ‘30s, Maelzel took the machine for one last hurrah around the northeast United States, during which Edgar Allan Poe developed a fondness for it and wrote his own treatise on the human-assisted operations he assumed were in place during gameplay. But the thrill of the Turk was fading. By the 1850s, with Maelzel having perished during a Turk tour of Cuba, the machine sat forgotten in the Chinese Museum in Philadelphia. It was there that, in 1854, it succumbed to a fire.